Christian Vind "SYNOPSIS – for a possible exhibition" (Installation view). Photo: Anders Sune Berg. From the big photograph of a mask carved in a chestnut, maybe 70 years ago, a couple of pin eyes gaze out of the window in Holbergsgade on the passers-by. Inside the doors of the gallery there is a point disappearing into a line, and a line turns into a roaring sea. Christian Vind "Som et punkt forsvinder in i en linje," 2018. Gouache and sticky foil on canvas, 50 x 200 cm. Photo: Anders Sune Berg. Christian Vind "Eye," 2018. Glazed ceramics, 21 x 35 x 20 cm. Photo: Anders Sune Berg. 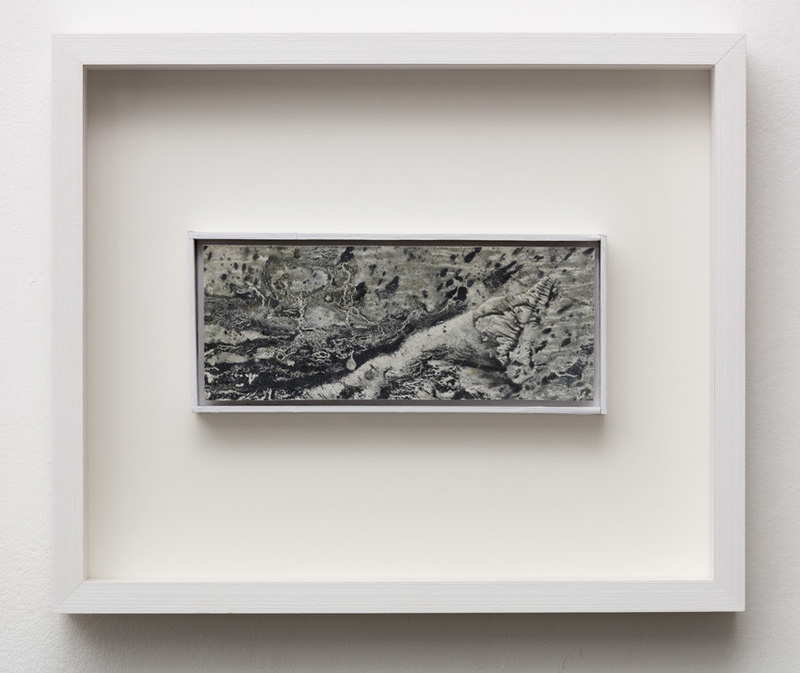 Christian Vind "Marine (roaring sea)," 1990-2018. SYNOPSIS-series, proposal 23. Acrylic on paper, glued on canvas, 27,5 x 33 x 4 cm. Christian Vind "The origin of Zero," 2018. SYNOPSIS-series, proposal 3. Unburned clay, cardboard and glue, 27,5 x 33 x 4 cm. A number of pin points. Temporary appearances, questionable references and suggestions. Fragmented, rudimentary and volatile. Constantly opens and closes the eye. Christian Vind "Moss found in a dark drawer," 2018. Photography, ed. 1/2 + 1AP, 108 x 152 cm. Photo: Anders Sune Berg. 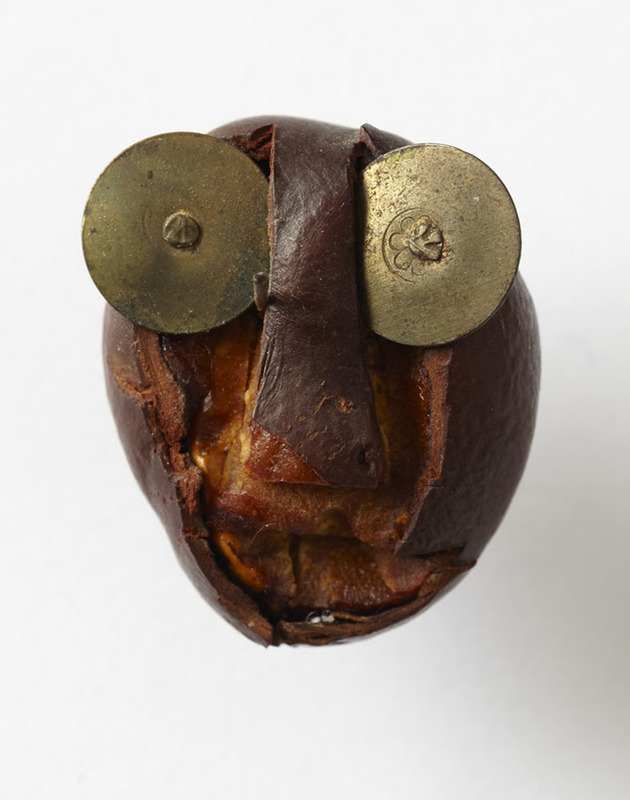 Christian Vind "Chestnut head (re-animated object)," 2018. Photography, ed. 1/2 + 1AP, 130 x 102 cm. Opening: Friday the 16th of February 2018, 5-7pm. Exhibition period: 16th February-7th April 2018. LAILA SVENSGAARD "WRITING SOUND. ONE HUNDRED DRAWINGS"